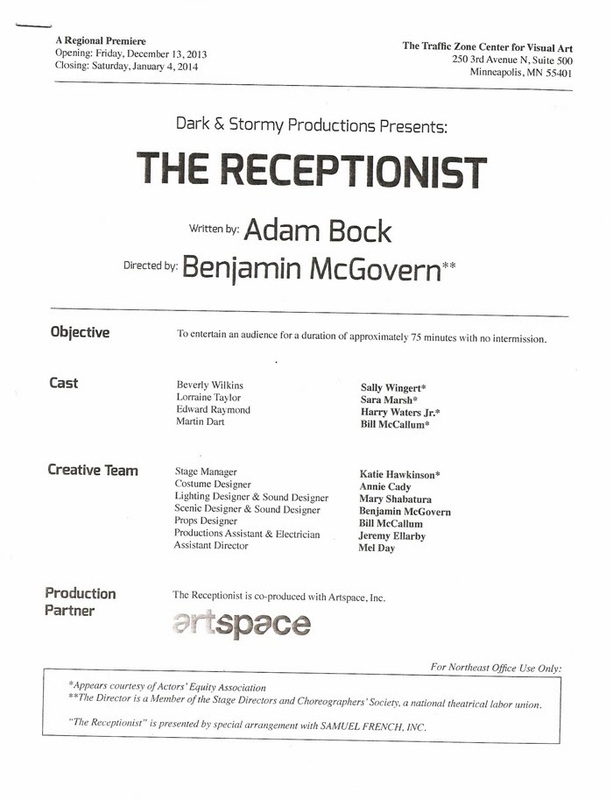 Dark & Stormy Productions continues their tradition of short, smart, sharply written plays performed by excellent small casts in non-traditional spaces with The Receptionist, a dark comedy about life in a not-so-typical office. Walking into the space above the Traffic Zone Center for Visual Art in the shadow of Target Field, it feels a little like going into the office. The receptionist desk, calendar, coffee maker, copy machine, and those cheesy motivational posters on the wall feel all too familiar. But the good news is when you walk into this particular office, instead of working you get to watch four actors at the top of their craft telling a familiar but wacky story. It's a short, crisp 75 minutes of theatrical entertainment. The "Northeast Office" seems like a typical office that will feel familiar to anyone who's ever worked in an office environment. Beverly the receptionist (Sally Wingert) and employee Lorraine (Sara Marsh) participate in normal daily activities like making copies, drinking coffee, answering phones, filing papers, bickering over office supplies, and chatting about family and relationships. The boss, Mr. Raymond (Harry Waters, Jr.), is noticeably absent when a Mr. Dart (Bill McCallum) shows up from the Central Office looking for him. It slowly becomes apparent just what the business of this office is, and it's not as typical (or as pleasant) as it seems. This four-person cast is top-notch, as directed by Benjamin McGovern (also credited designing with this very real space). First and foremost is Guthrie favorite Sally Wingert as the titular receptionist. I would watch her in anything, she is always such a delight, completely immersed in her character. And in this case that character is a stereotypical receptionist, answering phones, gossiping, keeping a close eye on the office supplies, and in general at the center of everyone's business. Also wonderful are Dark & Stormy's Artistic Director Sara Marsh as the co-worker with relationship issues, Bill McCallum (another Guthrie favorite) as the mysterious Mr. Dart, and Harry Waters, Jr. as the boss who's become disillusioned by his work, with disastrous consequences. I may not be The Playbill Collector, but I do have scrapbooks full of them and enjoy the artistry of them. Dark & Stormy is very clever in their playbill design. For their last show, Speed-the-Plow, set in the movie industry, the playbill was fashioned as a typewritten movie script held together by brass fasteners. For this show the playbill is constructed as an office memo, complete with rigid margins, bullet points, and a confidentiality note ("For Northeast Office Use Only"), held together with a single staple in the corner. Nice attention to detail and continuing the office theme. Part of Dark & Stormy's mission is to bring more young people (age 18-35) to the theater, and looking around the audience I'm not sure how successful they are in that, but they are very successful at creating smart, entertaining, intimate, all around high quality theater that anyone can enjoy. The Receptionist continues through January 4. 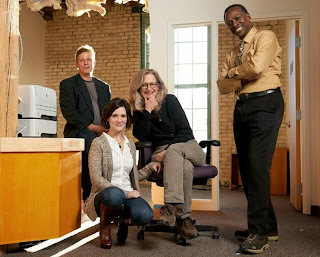 One visit to this office will make your own office seem not so bad after all!